Anyone going to Antarctica takes a risk — flying on cargo airplanes that land on ice, walking in areas with deep crevasses, disorientation in foggy or windy weather, and just surviving the extreme cold. Those risks are present even at a large, fully equipped town such as McMurdo Station, the base for American scientific research in Antarctica. Scientists venturing to remote research stations put themselves at even greater risk, since they must depend only on themselves and their equipment. 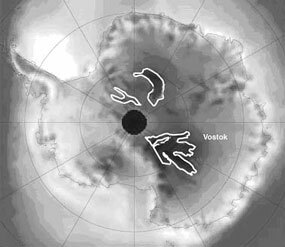 Few expeditions had studied this area of the Antarctic Plateau. But weather instruments nearby indicated that the megadunes team was heading to one of the most difficult regions of the planet. Even in astral summer, temperatures were expected to be around -20°F (-29°C), with a constant wind of 10 to 20 knots. The map below shows all the areas on the continent that contain megadunes. The megadunes expedition study site is within the area closest to Russia's Vostok station. An aerial image of megadune areas. Glazed area of snow in the megadunes study area. The research team set up a small camp at the field site to store equipment and use for shelter. Scott tents at the megadunes field camp. Sastrugi are usually just a foot or so high, but the TAM camp region had huge formations, over three feet (one meter) tall. Mary albert described the sastrugi she saw: "It was like a day at the zoo: dolphins, whales, and sea serpents. You could get lost among them." The photographs below were taken near the camp or on traverses by snowmobile. Photographs of sastrugi in the megadunes area. The wind is constant, which makes getting around difficult. The constantly blowing snow means that you cannot set anything down or leave things open without them being quickly buried or filled with snow. But the team was amazed to see that almost none of the snow stayed on the smooth surface — it all kept moving downhill towards the continent's coast. Only when there was an obstruction, such as a box or a tent, would the snow pile up. 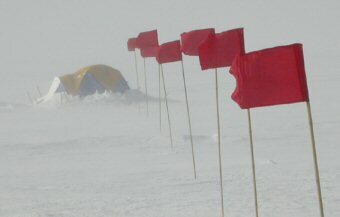 Notice in the following photograph how the wind is blowing the flags and creating drifts around the tent. Tents must not be placed close together in the direction of the wind, because the snow blowing over one tent can pile up in a huge drift on the second tent. Wind blowing around the camp.